Two stories in one book means twice the fun, the passion and the foibles and challenges that face two couples while falling in love. The first story, The Prince She Never Knew is about the painful transformation from puppy love to adult love, from loving the exterior to discovering the passionate and complicated emotions of the person hidden deep inside. It’s not a light-hearted romance but one that explores the pain and suffering of children when their parents are too into themselves and they forget to be parents, leaving the kids to find their own ways to deal with the emotional fall out. Leo pretty much walls himself off from everything and Alyse gives too much, almost like overcompensation. It’s how these two unlikely and hurt people, now adults, find their way to openly love and accept each other that makes this story so compelling. The author captured the stiffness of Leo and the yearning of Alyse by using clever dialogue, descriptions and environment. Secondary characters were only on scene to reinforce the elements that made Leo as dysfunctional as he was. It was Alyse’s strength of character that saved them. She had better insight into what made the hero tick once he let her in. It wasn’t a lot but since the heroine hadn’t shunned emotion or personal involvement in her own life, she was better equipped to recognize what was really happening and then deal with it. Not that she didn’t feel emotional pain, she did and the writing made that abundantly clear. Even though I thought Leo’s stubborn aloofness overshadowed the romance despite my understanding of why it happened in the first place, the romance’s progression was clearly shown. The story had elements and shadows of the past writing style of Harlequin romances but in this case, at least readers can get into the hero’s head and understand why he is the way he is. It gives a reader a chance to have empathy for his plight and a reason to want to him to have his happy ever after. The Prince She Never Knew is a poignant romance with heart. The second story in the novel is Kholodov’s Last Mistress which is another tale that explores the redemption of a tortured hero. When Sergei and Hannah meet it’s unconventional to say the least. The heroine is different than anyone he’s ever known and despite his best intentions to leave her be, he just can’t. She reminds him of something…or someone. It’s that tiny crack in time that fate drives a wedge through, making the hero face the man he’s become and open himself to the possibility that it’s not all he could be. Hannah makes all the difference – and it drives him wonky. The author painted a clear picture of the kinds of people both Sergei and Hannah are in the beginning of the book. Ms. Hewitt used dialogue, descriptions of eyes, mouth and skin color to mark their emotions and the effect their words had on each other. The story is told from both points of view and is well balanced so a reader feels that they’ve got a handle on the characters’ personalities. In fact, I’d say that Sergei had a whole lot worse childhood than Leo did in the previous story. I also think the author did a better job of making me care for Sergei than the other hero. No matter what Sergei thought of himself, Hannah, with her Polly Anna attitude, had it right. And I agree with her. Ms. Hewitt wrote one of the most impassioned, romantic and amazing scenes in this entire two-book novel when Hannah stood up to him, and really opened her heart to him. When she asked him that one simple question, a reader could almost see the light bulb pop over Sergei’s head. Genius. Another thing I enjoyed was seeing the transition and maturation of both the hero and heroine. They grew, changed and brought out the worst and best in each other. It was very much like Hannah and Sergei had to walk through fire, expunge all the burdens and perceptions they had of themselves and their backgrounds before they could go forth. It wasn’t easy and it certainly provided me with plenty of emotional drama that kept me flipping the pages. The best part is the end, when Sergei learned to trust, believe and to love and Hannah learned to recapture her sunny nature and balance her man’s newfound belief in himself. It was very poignant. The best part was the ending. It came full circle and I thought the delivery was brilliant, clever and very sweet. 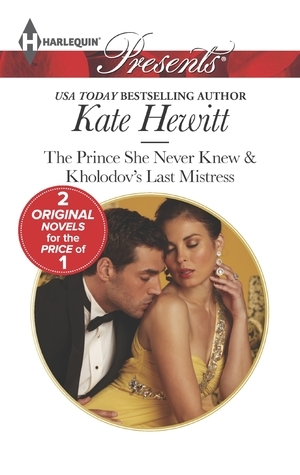 Of the two books, Kholodov’s Last Mistress was my favorite. If romance fans love reading Harlequins because they’re quick, interesting and fun, then rest assured these two stories deliver all of that. They’re not fluffy and brainless. No, these two explore tortured heroes and the women who lead them to salvation. It’s a showcase of love’s strength and perseverance and is worth taking the time to read.